She is not only known for her acting prowess. Michelle Dilhara of ‘Salsapuna’ fame is multitalented. She was recently in the spotlight for a totally different matter. She won the Asia Inspiration Award 2018 at the Second South Asian Youth Summit 2018 which was held in Colombo at the end of last year. Aimed at promoting peace in the region, the South Asian Youth Summit goes under the theme ‘Creating a Sustainable Future in a Fractured South Asia’. It is organized by the International Youth Committee (IYC), an International Youth Organization working to provide a policy framework and practical guidelines for national action and international support to improve the situation of young people around the world. Over 450 delegates from more than 80 countries took part in the event. Representatives from SAARC Observer nations too attended the event. Michelle and popular music composer Dinesh Subasinghe won awards for Sri Lanka. She had received the award from Malaysian Minister of Youth and Sports Syed Saddiq Syed Abdul Rahman. Michelle was chosen for the award due to her philanthropy work. This side of the actress is little known as she chooses to keep her social welfare work undercover. However she says that it is something she always wants to pursue because she wanted to touch the lives of the needy. “I was happy that I can help someone smile, share a few kind words, lend a helping hand or a sympathetic ear to those who are in need. Though I have not fully achieved my goal, I did the best I could during the past few years,” said Michelle. 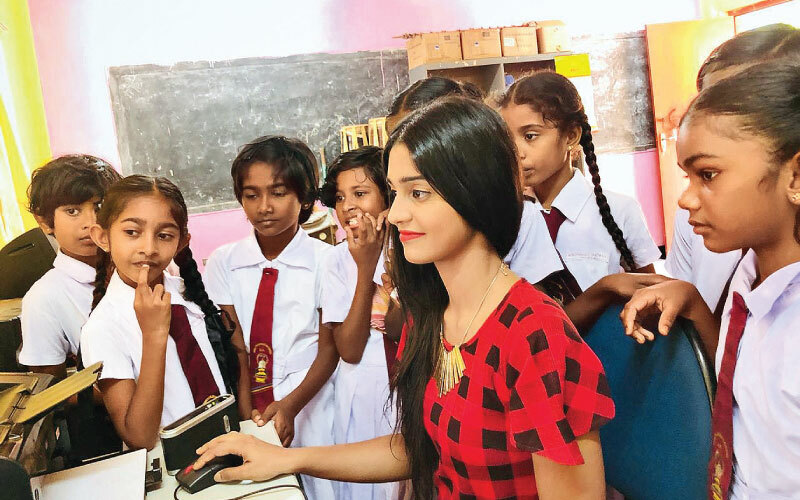 She had been inspired to venture into philanthropy related projects when she was around 15 years. She had been visiting her uncle at Negombo Hospital when she had witnessed a quarrel between a family and the hospital staffers about releasing two dead bodies. Returning in about an hour she had seen that one body had been moved and the other was still lying in the morgue. Two or three weeks later she had found out that nobody had come to claim the body and that it was still at the morgue. “This incident made me wonder that though the two dead people are from the same country, died at around the same time and lived in the same town, were treated in two different manners. There are people who have been marginalized and systematically overlooked by the majority. Homeless people, children and the elderly are such people who have been treated as if they are invisible. I decided to do something about this and look towards their needs,” she explained on how it all began and snowballed into a bigger project. Unfurling her memories on the South Asian Youth Summit Michelle noted that the IYC chooses 30 youth from Asia who will be the next leaders in spearheading a change in Asia. “The IYC held the event with the objectives of adopting the South Asian Women Commission and updating national policies with the youth in mind. Goals for the summit included increasing interconnectivity amongst youth movements across the region, identifying ICT training needs and increasing cultural exchange programmes,” she said. “It was a whole new experience for me working with globally renowned figures like IYC Chairman Dr K K Singh, Mauritius Youth and Sports Minister J C Stephan Toussaint, Malawi High Commissioner to SAARC nations George Mkondiwa, SAARC SAIEVAC Director General Dr. Rinchen Chophel,and IYC Advisor in India Dr. Archana Bhattacharjee. I consider it a lifetime opportunity and a life changing moment for me,” she enthused adding that French American writer Anais Nin’s quote ‘Each friend represents a world in us, a world possibly not born until they arrive, and it is only by this meeting that a new world is born’ sums up the experience perfectly. 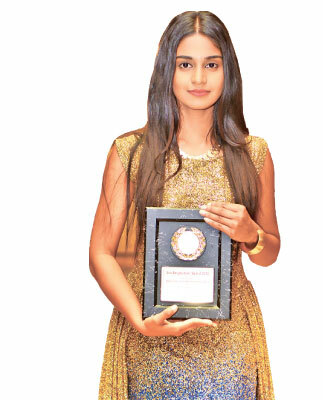 A product of Newstead Girls’ College, Negombo, Michelle had shown her flair for acting at a tender age. She had acted out roles she had seen on TV in front of her family. She joined Abhina Academy which is founded by seasoned actress Anoja Weerasinghe and also trained under Damayanthi Fonseka. She also studied the art from Indian Theatre Director Ujjwal Singha. Beginning her screen career in Nalan Mendis’ ‘Salsapuna’ Michelle had given life to many memorable roles. She is working on four teledramas these days: ‘Poori’, ‘Kanthoru Moru’, ‘Crime Scene’ and ‘Sri Siddhartha Gauthama’. She is also portraying one of the lead characters in two teledramas which will be telecasting in the future. “I am also working with the the Rajarata University on Nurturing Care Framework for Early Childhood Development with Senior Lecturer Duminda Guruge and his students. The projects focus on educating the rural area people on malnutrition in children and child wellbeing,” she expressed. “Everyone needs to have a goal in their life. You should try your best to achieve your goals, hopes and dreams no matter what barrier falls across your path. Goals are a way of life and they keep your everyday life interesting. So never back down or feel discouraged,” she opined. Michelle’s father, H Premawardena, is a businessman. Her mother’s name is E Jean Stella Fernando. She has two sisters Mishen Prasadika and Rochelle Fiona. Queried if she is interested in venturing into the beauty pageant sector and Michelle says that she is more into moulding her own future with her own custom-made bricks. “I want to stand out as a unique person one day. I experiment and have faced failures but someday I know that I will make it up an exclusive path that nobody had taken before,” she concluded with a smile.